Yesterday, the overblown state honors paid by the Chinese regime to Donald Trump, and the latter’s reciprocation with gushing flattery of Chinese President Xi Jinping and his wife, failed to prevent the US president from issuing a new threat against North Korea and delivering an ultimatum to China that it grant massive economic concessions to US corporations. Trump delivered his speech yesterday afternoon, in the Great Hall of the People in Tiananmen Square, to an audience of the Chinese Communist Party elite and flanked by President Xi. While, compared with other Trump speeches, his tone and rhetoric were measured, the content was nonetheless bellicose and ominous. On the spurious pretext that North Korea’s small nuclear arsenal poses an existential danger, US imperialism is preparing to launch a devastating war on the Korean peninsula. “The US is committed to the complete and permanent de-nuclearisation of North Korea … All nations must come together to ensure this rogue regime cannot threaten the world with its nuclear weapons. “Time is quickly running out. We must act fast and hopefully China will act faster and more effectively on this problem than anyone. US imperialism has, at the ready, the means to cause a “tragic situation”—or, more accurately, catastrophic death and destruction. Three aircraft carrier battlegroups are positioned off the coast of the Korean peninsula, along with cruise-missile armed submarines and an unknown number of Ohio-class submarines armed with ballistic nuclear missiles. Hundreds of Air Force jet fighters and dozens of long-range bombers are based in South Korea, Japan, Guam and Alaska. The naval armada will conduct exercises from November 11 to 14—the first joint exercise involving three aircraft carriers in more than a decade. Trump’s statement that “time is quickly running out” is particularly ominous, given that two of the battlegroups cannot stay in East Asia for much longer. One, the USS Theodore Roosevelt, is only in the region as it transits to the Persian Gulf. Another, the USS Nimitz, has been on operational deployment since June, and is scheduled to return to its base on the US west coast for maintenance and rest. Iraq and Libya submitted to similar US demands, only to be invaded and their leaderships executed. There is little doubt that intense diplomatic talks are taking place behind the scenes—involving American, South Korean, Chinese, Russian and other officials—to pressure the North Korean elite, headed by Kim Jong-un, to make some form of capitulation to the Trump administration. Even within the US military there is trepidation about the consequences of war. A report prepared by the Pentagon warned that the only way to achieve the Trump administration’s stated objectives would be a “ground invasion” of North Korea. An invasion would require hundreds of thousands of troops and, given recent experience in Afghanistan and Iraq, and the history of Korea itself, would need to be followed by protracted and bloody operations to suppress an anti-occupation insurgency. The financial cost would run into the trillions of dollars. The human cost would be hundreds of thousands, if not millions, of lives. This stark reality only heightens the danger that nuclear weapons will be used for the first time since 1945. The threat of war against North Korea is not motivated by any concern in Washington over North Korea’s nuclear program, let alone the “freedom” of the North Korean masses. It is part of a calculated strategy by US imperialism to use military force to reverse the ongoing emergence of China as a rival centre of strategic and economic power in the Asia-Pacific and internationally. 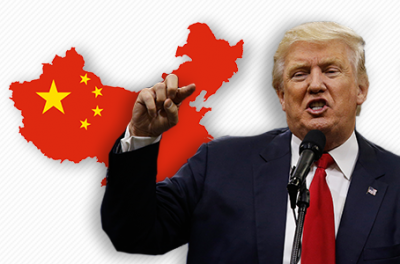 Trump’s speech yesterday in Beijing underscored the fact that more than 25 years of continuous wars of aggression by the United States have been driven by the determination of the American ruling elite to stem the decline of its post-World War II economic and strategic dominance. He combined his threat to plunge East Asia into instability and turmoil, by launching a war on the Korean peninsula, with veiled threats that China must open its economy to US banks and corporations—or else. Trump told Xi Jinping and assembled CCP dignitaries that the US trade deficit with China was “as high as $500 billion a year”—far higher than the official figure in 2016 of $347 billion. Trump declared “I don’t blame China” and tried to score domestic political points by accusing past administrations of responsibility for the trade deficit. The reality, however, is that contained within his speech is the same confrontational stance toward Beijing that animated the Obama administration’s military “pivot to Asia,” and its terms for membership in the proposed Trans-Pacific Partnership (TPP) trade bloc. Obama had insisted that Beijing would only be able to join the TPP after it removed obstacles to American corporations competing in China’s domestic markets, including, and most controversially, its banking and finance system. His administration had also demanded that China accelerate the privatisation of its state-owned companies, and legislate the same protections for intellectual property rights as exist in the US and elsewhere. Control of patents ensures the flow of hundreds of billions of dollars in royalties to American-based technology, pharmaceutical and other conglomerates. Trump has repudiated the TPP, but is seeking the same ends as Obama, albeit through other means—the threat of tariffs and trade war and the imposition of other sanctions on Chinese-based corporations. His Beijing remarks suggest that he will make demands for concessions to US corporate interests at the Asia Pacific Economic Cooperation (APEC) forum that begins today in Da Nang, Vietnam. At the same time, while his administration has abandoned the term “pivot” or “rebalance,” it is continuing with concentrating 60 percent of the American air force and navy in the Asian region as initiated under Obama in 2011. The strategic rationale behind this military build-up is the calculation that economic competition between US imperialism and the Chinese capitalist oligarchy will ultimately lead to clashes and the potential for war between the two nuclear-armed powers. Preparations for a conflict with China is what ultimately lies behind the drive to use the pretext of North Korea’s nuclear weapons to bring about regime-change in that tiny country, and its incorporation into US-aligned South Korea. Such an outcome would create the conditions for American and allied forces to deploy directly along China’s northeastern border with the peninsula. In 1950, hundreds of thousands of Chinese troops were sent to defend North Korea from a US-led invasion force, in order to prevent precisely this from taking place.